This figure was included in the Cloud City Playset, but made it's first carded appearance on The Empire Strikes Back 41 back card. 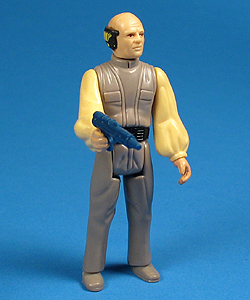 This figure also appeared as Lobot (Lando's Aid) on a Canadian exclusive skin wrapped card*. The original card image featured on the Empire Strikes Back and Return Of The Jedi cards was swapped out for another image on the Tri-logo card. Comments: Perhaps the vintage Lobot action figure isn't as exciting as, say, either of the Bespin Guards or the Cloud Car Pilot, but certainly was an intriguing character in the film, and that likely had a lot to do with the figure's success on the toy shelves-- That or maybe it was the fancy shirts he had a proclivity for wearing that Star Wars fans went nuts for. The breast pockets: on the first version the pockets are separated slightly from the lines going vertically down the figure's tunic, where as the second version's pockets are butted up to the lines. The trousers zipper: The zipper on the second version is much thicker and comes to more of a point. Lastly, though much more difficult to spot in photography, the belt buckle on the first version features from left to right a square (with a smaller square centered in it), two vertically placed smaller squares, then four short horizontal rectangles. 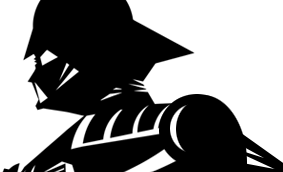 The second version's belt buckle has from left to right a square (with a smaller square centered in it), two vertically placed circles, then four longer horizontal lines. There is no indication whether either version is any more rare than the other.